The Shark Rotator is a unique lineup of vacuums that can transform themselves into 3 different machines: a standard upright, a versatile canister, and what they call their Powered Lift Away. It’s like buying 3 different models in one which opens up a lot of possibilities for cleaning items that were previously difficult to reach. Most homeowners almost never clean under beds and furniture, and rarely get the dust off curtains and blinds. This means there are a lot of unhealthy allergens left behind after weekly cleaning sessions, just waiting to be stirred up into the air. 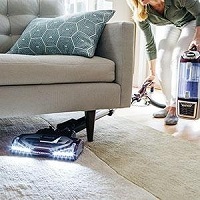 Shark took a unique approach to solving the problem and the result is a single vacuum cleaner that can actually get all surfaces completely free of dirt. In upright mode the Rotator is just like any other full sized vacuum with a good amount of suction power. It can cover a wide area of carpets, both low and high pile, and has a swivel neck design for more maneuverability. The neck rotates back and forth so you can easily steer it between objects without having to move it back and forth. This is the problem with traditional uprights (especially full sized ones), as you have to constantly back up and move them to traverse around your home. Shark added what they call “Dynamic Power Steering” so you no longer have to do this. It saves you time and energy since you are making fewer movements during use. What Exactly Is Powered Lift Away? The best feature of this versatile Shark is by far the lift away mode. You can detach the main components, including the motor, from the body and still have it fully function. You still get full suction and spinning brushes but the advantage is you can now extend the power head underneath just about any type of furniture or dresser in your home. You really need to try it once to see just how much of a game changer this is in the home cleaning industry. It solves the biggest problem people have when vacuuming: reaching under things where normal vacuums don’t reach. You can even put smaller attachments on for stairs, upholstery, and curtains without losing the ability to pull embedded pet hair or dust mites out of the rug fibers. This is especially important for households with one or more pets. Once you are done you can simply snap it back into place and you have your upright ready to go. Having a fully sealed internal pathway is the only way to prevent dirt from escaping back into your home. The Rotator combines this with a HEPA filter to trap 99.9% of those microscopic allergens like dust mites, mold spores, pet dander, and pollen as the air passes over it. They call this their Anti-Allergen Complete Seal Technology™ and this guarantees the air coming out is much healthier than what is going in. You can have all the suction power in the world but if you don’t have a high quality HEPA filter then most of the tiny organisms will just pass right through. And it is these allergens that make it hard for those with asthma or allergies to breathe easy inside. A clean indoor environment is a must. Two Versions…Which Is Best For You? The Shark Rotator comes in two different bagless models, the Speed and the Standard unit. The biggest difference between them is the Speed is more compact, lighter, and has less dirt capacity than the standard configuration. They both have remain fully powered in the Lift-Away mode so you can reach under various items while still having a spinning brush roll to stir up dirt. The Standard model also operates as a fully functional canister vacuum cleaner which is something the Speed is not equipped to do. 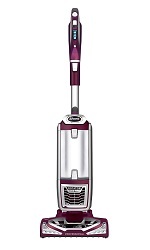 It’s easy to see why the Shark Rotator powered lift away is one of the most popular vacuum cleaners sold to homeowners today. You might think that all of this functionality comes at a big price but nothing could be further from the truth. It is actually one of the most affordable full sized uprights as well. There really are no negatives against it. It handles carpeting as well as it handles hard floors, and can reach under things that no other upright can. It’s like having 3 different vacuums in one. For more information including current pricing and shipping options, click here to go to our favorite eCommerce site.